Perhaps you saw an article in a recent BBC News magazine about how US craft beer is inspiring British brewers. The Americans say they’re not bound by tradition, with the clear implication that the Brits are. And yet it was insipid American beers — like making love in a canoe, we used to say — that triggered the rise of microbreweries and craft beers. Now very hoppy beers with all kinds of flavours are big there, and increasingly big in the UK, and one result has been a resurgence of interest in British-bred hops. One of these, OZ97a, is being hailed as a new star of British brewing, not least by Mark Dredge, an award-winning beer writer. I read about OZ97a at Pencil and Spoon, Mark’s blog. Of course I had to talk to him. The thing about OZ97a is that it isn’t a new variety. It was bred in the late 1940s or early 1950s, but when brewers first got a whiff of it, in 1960, they rejected it out of hand. Way too tasty, with all that fruitiness. Not what beer-drinkers want. But with the rise of intensely flavourful US beers, by 2012 OZ97a was ripe for a renaissance, and a couple of test batches confirmed it as a great hop. So how had it survived? In a field genebank, run by the British Hop Association. It is quite common to hear that genebanks should be maintained as a source of breeding material to adapt to changing conditions. But this is the first time I’ve heard of the changing tastes of consumers being the conditions that need adapting to. Mark Dredge’s book Craft Beer World will be available at the end of April 2013. Another genebank beer in the news is about to be launched. It was brewed from Chevalier, a century-old barley in the John Innes Centre’s genebank, re-evaluated because it is resistant to Fusarium wilt. 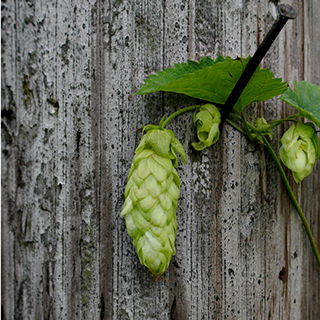 Photo of a hop flower by Ronald Bunnik. A bit of history about a new, old hop.